Cost: £35 per head for three courses, including a drink to start, and coffee after the meal. About: The Blackout Banquet is a huge, 140 seat dining table stretching more than 100 feet along the riverside terrace outside Le Pont de La Tour, Cantina del Ponte, Blueprint Café and Butler’s Wharf, which will be serving a rotating menu from the four restaurants every night during the Thames Festival between 6th and 15th September 2013. It offers a special fixed price menu, at £35 per head for three courses, including a drink to start, and coffee after the meal. The event has been designed to highlight the experience of darkness beside the river, replacing artificial light pollution with the subtlety of candles. It echoes the festival’s aim of celebrating the history and beauty of the Thames, whose surrounding landscape has been transformed by some of London’s most challenging modern architecture. The long banqueting table was beautifully decorated with all sorts of different candles which cast a flickering light over the food, while the gently lapping water sparkled darkly outside. It was almost like being at someone’s wedding - really rather special indeed. What we ate: I wasn’t able to get away from work in time for the mushroom consomme starter but my friend very kindly saved me the Amuse, which hailed from the Blueprint Cafe - a delicious bowl of black lentils with a tamarind-spiked sour cream which along with some beautifully soft, dark bread, was my favourite dish of the meal. 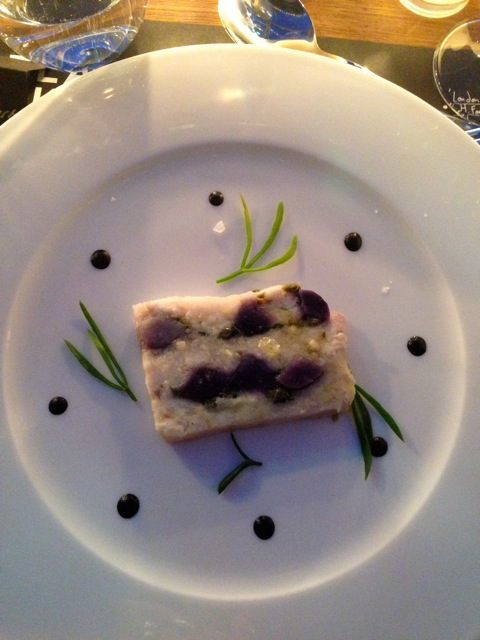 The main menu had offered a Le Pont de la Tour terrine of skate wing to start, with purple potato and dots of squid ink dressing, which looked very dramatic on the plate. My vegetarian main, from Butler’s Wharf Chop House, was a wild mushroom scotch egg, which came with a delicious mix of fried wild mushrooms and cubes of Jerusalem artichoke, topped by a couple of slices of English black truffle. Meat eaters were offered roast wood pigeon sourced from the Thames Valley, with some gently spiced braised beetroot and turnips spiked with cubes of soft, gutsy black pudding. Dessert was a very creamy, just-set panna cotta with a tart compote of berries on the side, made by Cantina del Ponte. 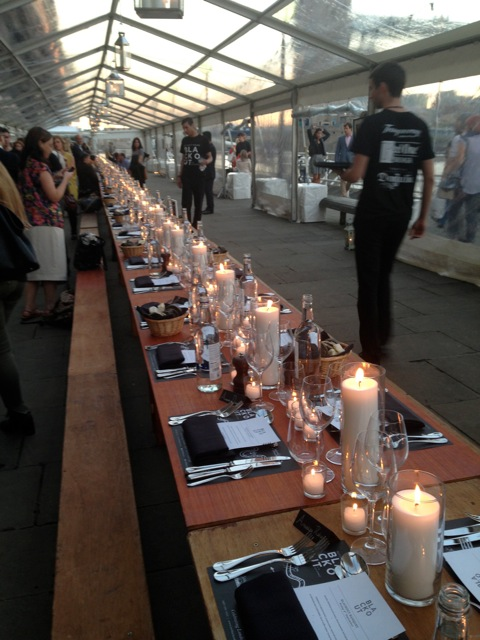 What we liked: The setting was absolutely beautiful: a lot of care had been taken to create this dramatic, long table, and it was a rare opportunity to dine by candlelight in such a gorgeous location, which must offer some of the best views in the city. The service for such a large group was run like clockwork, and we applaud the way the food was sourced locally to showcase some of London’s best seasonal produce. 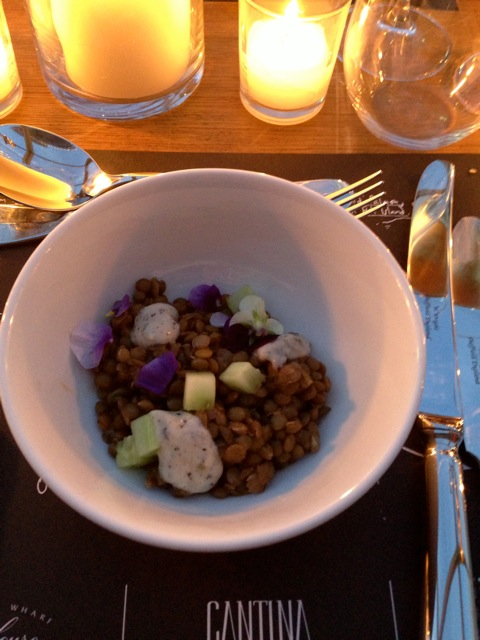 What we didn’t like: I wasn’t sorry I had missed the vegetarian starter - it had identical ingredients to the main course, which lacked some imagination. 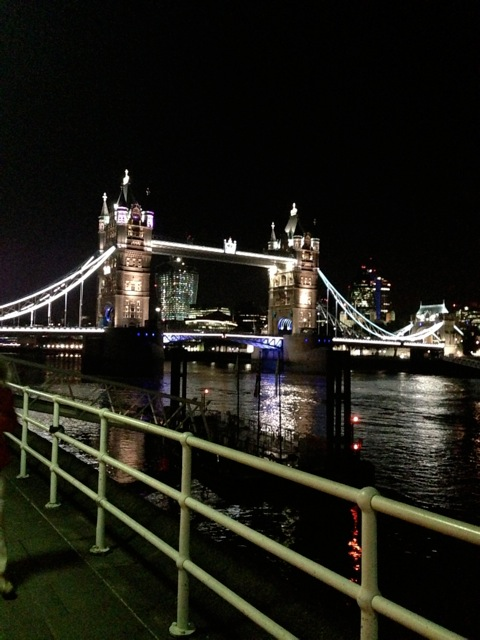 Verdict: We really enjoyed our culinary, candle-lit taste of the Thames Festival: London is at its best when celebrating its natural assets, and it was a real privilege to be part of such a one off experience. If you can’t get a seat at the special banquet table, the restaurants involved are all offering their own set menus throughout the festival, with other events to tie-in, from blindfold cocktail tastings to something riskily described as a fire menu. Meals at the ‘Blackout Banquet’ banqueting table run every evening throughout the Thames Festival and lunchtimes at weekends. Reservations can be made via 0207 940 1833 or visit http://thamesfestival.org/events/info/butlers-wharf-blackout-and-blackout-banquet for more information.